Underdog Bernie Sanders has been climbing in the polls and gaining on Hillary Clinton. The self-described democratic socialist Vermont senator with so-called radical stances on income inequality, education, and climate change has been drawing huge crowds. According to the Huffington Post, on Saturday, a crowd of 11,000 listened to him speak in Phoenix. As his campaign ramps up, I can't help but wonder: What about his potential first lady? 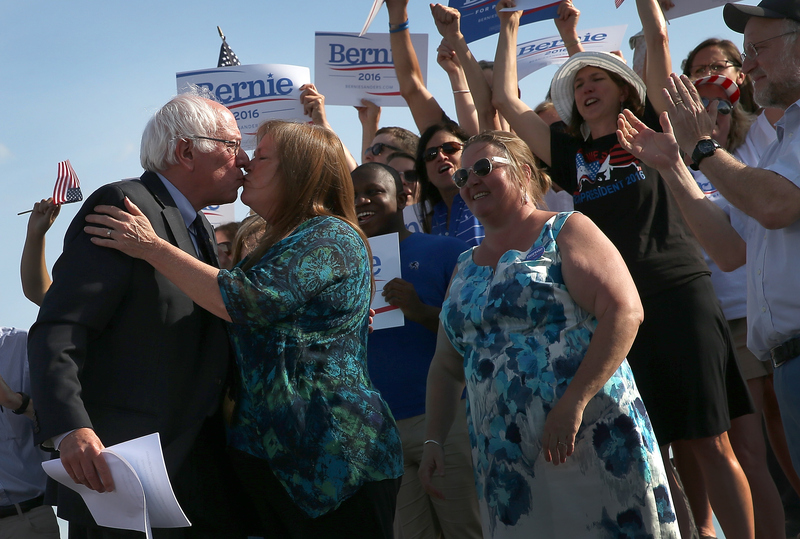 Who is Bernie Sanders' wife, Jane O'Meara Sanders? Jane is most known for serving as the fourth president of Burlington College, from 2004 to 2011, but she's done much more than that. During her career, she's worked mainly in education and government. According to LinkedIn, in the '90s, she served almost 10 years as the director of youth services in Burlington, Vermont, and then volunteered in Bernie's congressional office as a press sectary and policy analyst. The New York Times wrote in 2000 that Jane Sanders "has been a key adviser in his political career." Before working at Burlington College, Sanders was an education and politics consultant at a Vermont-based firm. Bernie might be the one running for president, but don't underestimate Jane even a little. According to LinkedIn, she studied child development at the University of Tennessee, Knoxville, and later got her Master's in social work from Goddard College. She also received her PhD in Leadership Studies in Politics and Education from the Union Institute and University in 2000. As for her relationship with Bernie? According to the New York Times, the couple met the night he was celebrating his victory in the mayoral election in Burlington in 1981, and they were married in 1988. Ironically, according to Bloomberg, the two grew up 15 blocks away from each other in Brooklyn, New York, but in differing environments — Bernie in a Jewish immigrant home, while Jane attended Catholic school. He came, and everyone was swarming around him and the other candidates, because they weren't supportive of the mayor, so, being the good Catholic girl, of course I was very nice to the mayor and barely even said hello to Bernie. But when I heard him speak, well, that was it. The police department I was working with supported him after that, and he won 10 days later. We met at the victory party, and that was the beginning of forever. According to Bernie's website, he and his wife live in Burlington together and have four children and seven grandchildren. Bloomberg reports that in 1996, Bernie spoke affectionately of his wife, saying, "Yes, she is a soulmate, a sounding board." Aww.